Family owned furniture retailer celebrates its 90th year. with a focus on creating a work-life balance for employees. The editors of Furniture World magazine don’t very often find an aura of fun hovering over a home furnishings industry press release! But this was undeniably the case when the owners of BILTRITE Furniture-Leather-Mattresses announced their 90th year in business. It equated to visiting BILTRITE’s 45,000 square foot showroom with a trip to “the industry’s own Wonka Chocolate Factory”! The release tempted us to guess that a good humored work-life balance governed the company’s philosophy and business plan. That also happens to be true, all the way back to the sunny days before the Great Depression descended upon the U.S. economy. Back to BILTRITE’s founder, Irwin Kerns, by trade an upholsterer of high end custom made sofas, a family man who emigrated with his wife Frieda from Russia to Milwaukee, Wisconsin, in the early 1900s. Don’t misunderstand, plenty of midnight candle burning and plain hard work went into the mix. Irwin opened a store on 3rd and Garfield to sell the sofas he built. They were so well made that in 1928 he was selling them for $1000, a pretty big ticket at that time. That’s the origin of the company name. The sofas were “BUILT RIGHT”. In 1948, the family moved premises from Milwaukee’s north side to 7th and Mitchell Streets. Here they shifted their focus from manufacturing to retailing. 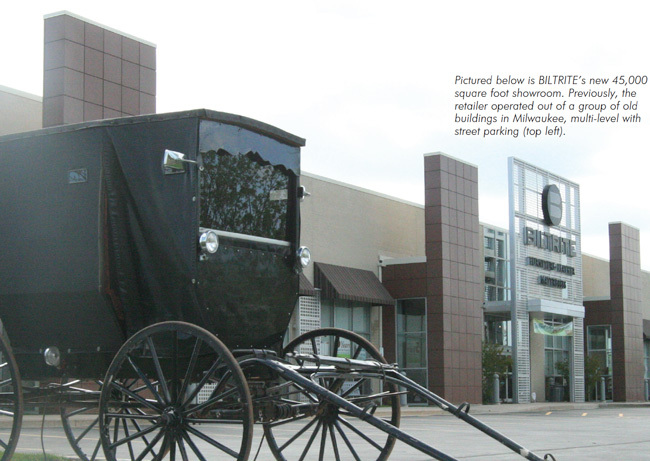 Customers paid attention, and BILTRITE continued to expand until 2006 when they finally had to move shop again, their offices, warehouse and showroom. “We needed to move. Our Mitchell Street location neighborhood had changed not for the better, and we needed a modernized showroom and facility. We had a group of old buildings that were multi-level with street parking. It was time for a new building and warehouse with a parking lot off the Interstate located on ‘furniture row’ in Greenfield, Wisconsin,” said Randi Schachter, a fourth generation family member. The family conducted an in-depth search for just the right location and, when they found it, helped design the new BILTRITE, “with customers in mind”. The 20-year mortgage was paid off in less than 10 years. “Owning your real estate will control your destiny for the better. And, just as owning your own real estate, owning your own inventory will control your destiny for the better, too. This allows us to compete when times get tough and through the good times. Two generations of the family run the business and work in the store. “Martin and Gail, third generation, and Brad, Sarah and me, fourth generation. Gail, Sarah and I work on the showroom floor directly with our customers. It is unique in our industry to have senior management/ownership working on the floor on the weekends. Gail manages the store and office staff, oversees human resources and is involved in design projects. I am spokesperson for the store, responsible for sales and marketing, managing the sales team, assisting with overseeing the office staff and human resources, in-store displays and social media. And I’m also involved with design projects. “Sarah trains new sales associates, helps with managing the sales team, leads design projects and helps with social media. Gail, Randi and Sarah spend a great deal of time in the research of constantly changing design and color approaches, and they all find that “Markets are wonderful! High Point in October and April, Smith Brothers Market in March and September, Las Vegas in January and July and the Ohio Amish Show in March and September”. BILTRITE is without doubt a family affair! So a “work-life” balance has always been their philosophy. "From 1928 to 1984 we were closed on Sundays. Then, until 2016 we were open. In 2016, we made the change back to closing on Sundays. It was the BEST thing we ever did! “We have received so much positive feedback from new and old customers about how much we value family time for our team. It has also been great for recruitment, since employees can be with their families on Sunday, except for the five Sundays we are open during holiday weekends, New Year’s, President’s Day, Memorial Day, Labor Day and Black Friday weekend. “It was a group decision made at family dinner on Easter Sunday.” Marty had been ill and during his recovery “realized that now a grandfather he had spent little time with his own children as they were growing up. By closing Sundays, he wanted to make sure his children and employees had quality time to spend with theirs. Plus, he wanted to enjoy his grandchildren.” Remarkably, Marty had ”started in the business at age 12 and been focused on BILTRITE for more than half a century. “Our competitors told us we would be out of business within a year.” The opposite actually happened and BILTRITE’s sales revenue went up seven percent the following year. Prospective employees were attracted to the company due to their family-friendly reputation. Marty attributes sales growth to customer and employee appreciation for the policy. “Our motto is ‘Seven days of business in six days’, and we are doing it! BILTRITE has continued to grow each year and we should have closed on Sundays years ago! Wage packages are structured so that “Full-time employees receive health, dental, vision coverage, paid vacations and an old school employer-sponsored retirement profit sharing plan, not a 401K." More often than not, two or three family members are in the store at all times. On Saturday and on action-packed holiday weekends, all five will be present. Personal contact with customers has been key to building long-term relationships. BILTRITE’s “sprawling” showroom offers good, better and best options in all their furniture categories. And if an item is not in stock it can be custom ordered, selecting fabric, leather, wood, finish and hardware. Signage, lighting and placement assist in directing customers after they’ve been welcomed by the showroom receptionist. “When we moved into our new location in 2006, we were able to increase our selection options due to the additional space. 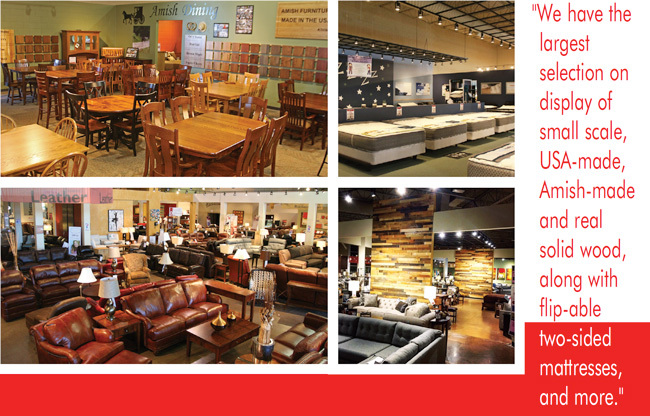 “We have the largest selection on display of certain furniture categories including small scale, USA-made, Amish-made and real solid wood, along with flip-able two-sided mattresses, living room, sleeper sofas, recliners, TV stands, bedroom, glider rockers and more. “Our largest demographic is 35-plus. “Small scale furniture is for all generations whether you are short like me (I’m 5’2”), or if you have a small room to fill. We say it is for apartments, condos, small homes and senior living. Which means it is for all generations. We have the BEST assortment in Milwaukee and the country. We have specialized in small scale furniture for over 25 years and even have a small scale furniture commercial that features a story line about how short I am. The customers love it and get it! “Our Amish furniture speaks for itself. It’s handcrafted, made of solid wood, lasts for generations, available in custom options and it’s made in the United States. Amish furniture includes every style and look from modern to transitional, to Arts and Crafts. It is very affordable. We have occasional tables made by Amish builders that cost less or the same as tables from our imported manufacturers. And our Amish-made furniture is made in Ohio. “We’re very proud of our mattress center. We have the most unique mattress selection in southeastern Wisconsin, including flip-able, latex, hybrid, adjustable bases and more. We chose not to carry the ‘S’ brands since they are all owned by private equity/Wall Street groups. Instead, our selection includes Therapedic made privately by the Bedding Group in Illinois, Restonic made privately by Clare Bedding in Michigan, Aireloom from California and made in Pennsylvania, and Symbol made in Wisconsin, which offers better quality, less customer warranty exchanges and competitive pricing. And, “We offer old school white glove delivery, a personal touch. Before delivery we open boxes, inspection is done by our trained technicians, and we blanket wrap all items for delivery and set-up in customers' homes. “We even open all items and inspect for pick-ups, too, as opposed to delivering items in the box or giving items in a box for pick-ups. “When a customer makes a purchase, if there is a question about whether the furniture will fit through the doorway, Martin will go to the customer’s home and measure before the furniture is delivered to ensure it will fit. BILTRITE’s marketing outreach is extensive. “I oversee our website with my team, and work directly with Brew City Marketing, a local website marketing firm located in Metro Milwaukee. Brew City powers the site, maintains it, and is always thinking of how to make it better. They are also involved in our Google AdWords and Facebook advertising. We do not sell products online. And there is a great deal of community involvement. “We particularly love working with the Grand Ave Club of Milwaukee, which helps people with mental illness regain their confidence, acquire paid employment and go to school so that they may have satisfying and productive lives. We have had members of the Grand Ave Club working in our store as custodians since 2006. Since moving to Greenfield in 2006, BILTRITE has experienced year-over-year growth, operating their high volume single store with an above industry average sales per square foot percentage.